Is he not cute? 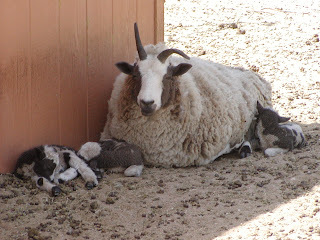 This is one of Garnet's rams. The other looks just like him, with slightly different markings. 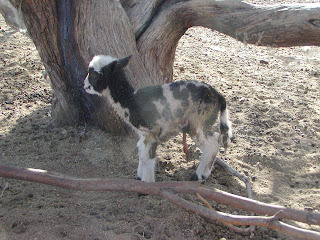 This is the second ram. It was hard to pick out his coloring that early in the morning and he was still kind of wet. Here are all three together with mom. 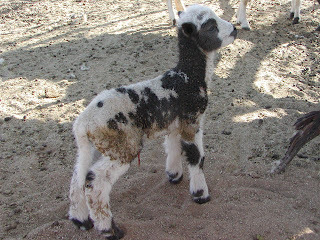 The one closest to the Garnet's head is a lilac ewe. definitely a keeper. 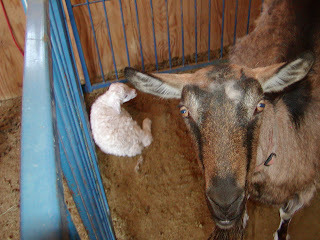 Holly, our dairy goat delivered last night right before I got home from the fair. Her buck is huge and already the size of month old angora kids. Next year, I will be smarter and put her in for breeding a lot earlier. Almost all of the rest have delivered! If any of you are hankering to have a try at milking a goat, you can meet me at the gate at 9:45 most mornings (not workshop days) and I will teach you how. Since she is also feeding her buck, I will let you off easy. You will only have to milk one teat. I got 1 quart out tonight and will start milking one side of her, since the kid is mostly drinking from the other. I wanted to get some colostrum, in the event that I might need it for another baby. A lot more work to milk, but it is a whole lot cheaper than buying milk replacer!